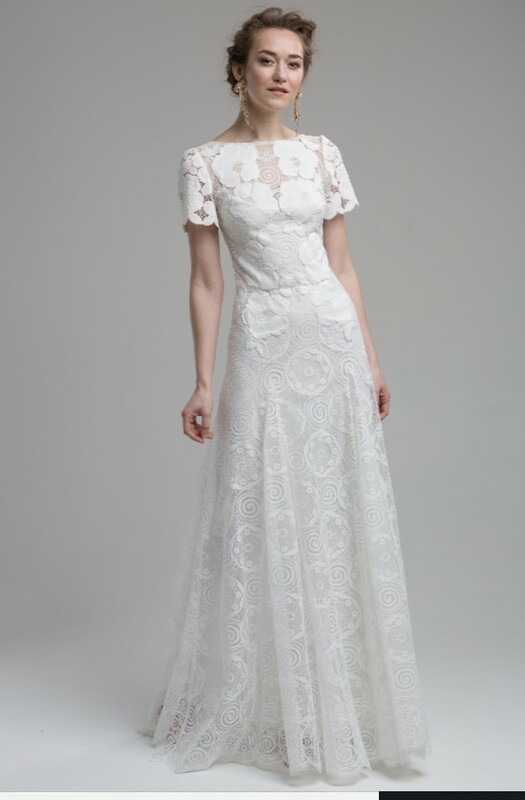 Beautiful lace dress from the Katya Katya Wanderlust Collection. Bought as a sample dress, not been worn by a bride. I love this dress but bought very early for wedding which ended up going down different route/style so not worn by me. Outer lace dress is labelled as a size SMALL. However, I am a UK size 6 and it was large on me, more UK8-10 but can be altered to fit. Comes with an ivory slip in size 6- however I am usually a 6 and it was big on me, would say more size 8. Dress is pinned to me in photos. I am 5ft 2in but standing on tiptoes and I would have needed to shorten. Very small foundation mark on inside of neckline, came like this from sample sale, not visible when worn but could be easily cleaned. Only tried on by me twice, both times with no makeup. Also comes with both a light blue ribbon belt with bead and crystal details worth £250, from Katya Katya, AND a plain textured ribbon (see both in photos). Dress is listed as £1800 on website and belt £250. Dress will come in KatyaKatya protective bag. No refunds but please message with any questions. Once you send a message, Esme can invite you to purchase the dress.